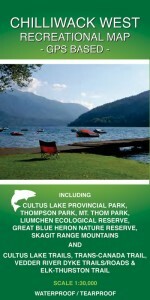 Buy the Southern Chilcotin Mountains Guidebook and Map and get 10% OFF. 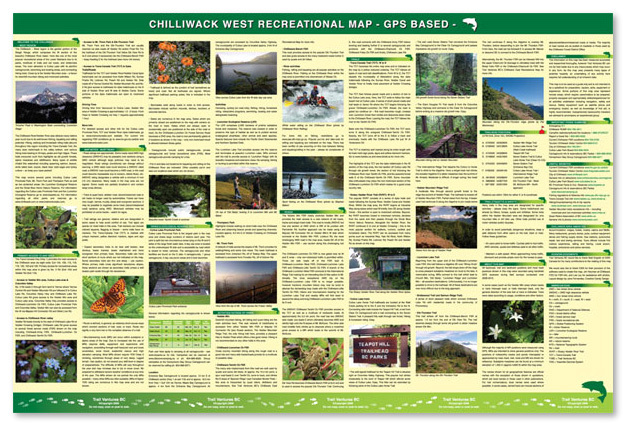 Buy two or three maps and get the Chilliwack West Map for FREE. 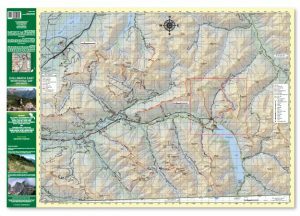 The first GPS based, topographic trail maps for the Chilliwack area. Published in 2010 by Trail Ventures BC. 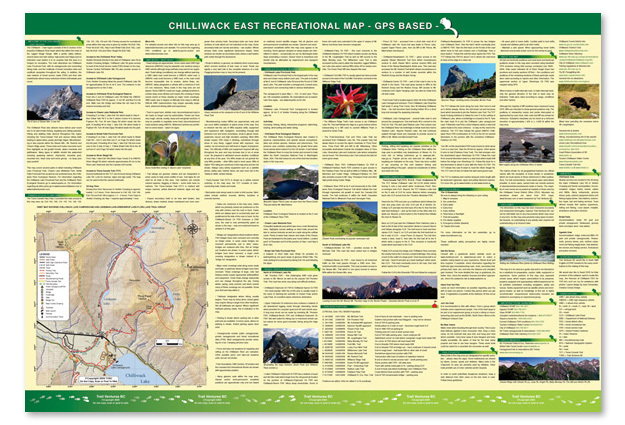 These Chilliwack trail & back road maps will appeal to hiking, mountaineering, horseback riding, mountain biking, snowshoeing, fishing, rafting and kayaking enthusiasts. 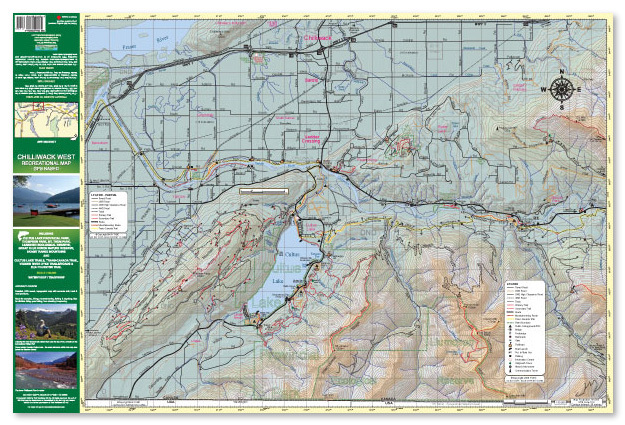 These Chilliwack hiking trails & forest service road (FSR) maps are also useful for out-of-park activities involving dirtbike, quad & 4WD in back road areas such as Vedder Mountain and Chipmunk Creek. All Chilliwack roads, tracks, trails, routes and majority of mountaineering routes were GPSed from 2006 to 2009. This map was prepared with attention to detail. Chilliwack roads are rated according to road conditions: paved road, 2WD road, 2WD High Clearance road, and 4WD road. Likewise, trails and routes are rated to help guide users through the map area: track, primary trail, secondary trail, route and mountaineering route. This detail will be of particular use in navigation where trail or back road conditions vary significantly over short distances. 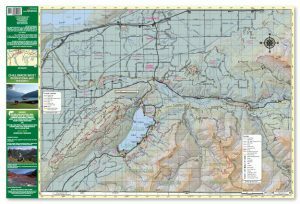 In addition, small side creek and trailside pond positions, not indicated on any other maps, are shown for navigation purposes. 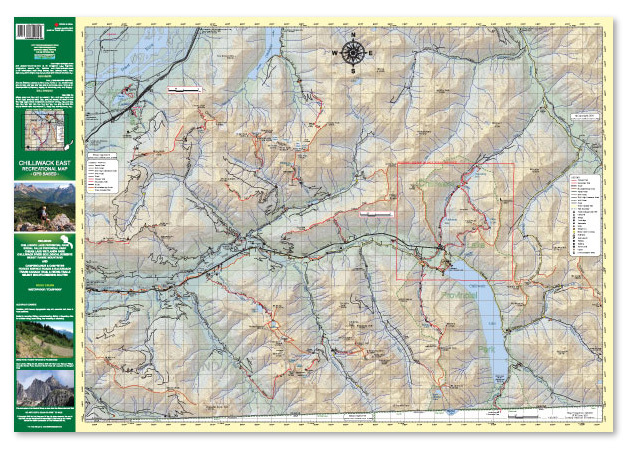 Trail Ventures BC’s maps are based on extensive, detailed field surveys conducted on foot. Locations of Chilliwack campgrounds, campsites, footbridges, major creek crossings, bridges out, gates, barricades, boat launches, caves, historic sites, and put-in/take-out sites are shown. Trailhead locations are shown and UTM positions are given. Map projection/datum: NAD83. UTM gridlines plus gradations on the outside of map frame; and lat/long gradations on inside of map frame. Approximate Chilliwack glacier positions are shown where glaciers exist. Information about primary Chilliwack access, parks, roads, trails, activities, information sources, amenities, etc. on the back side of each map. To order Trail Ventures BC’s GPS-based Chilliwack maps – click here. © Copyright 2009 by Trail Ventures BC Inc.
© Copyright 2005-2019 by Trail Ventures BC Inc. All rights reserved. No part of this site may be reproduced or transmitted in any form by any means without the written permission of the publisher.